That air bag suspension kit is working great, but that doesn't make up for the pain it is to try and find air sources out on the road. Air Lift LoadController air control systems make life easier by allowing you to increase and decrease air bag pressure on the go. Air Lift LoadController air control systems are available with either a standard duty or heavy duty compressor. The systems are also available in either a single or dual path. Single path systems allow the air bag pressure to be adjusted simultaneously, providing front-to-back leveling. A dual system allows the air bags to be inflated simultaneously or independently. The benefit of a dual system is that it provides side-to-side leveling as well as front-to-back. This system is ideal for uneven loads. LoadController systems are designed to work with Air Lift LoadLifter, RideControl, and other brands of air bag suspensions. If your truck is already equipped with air suspension, then bring it to the next level and add a little convenience to your life. Install an Air Lift LoadController air control system. Get yours installed today and dominate the road! 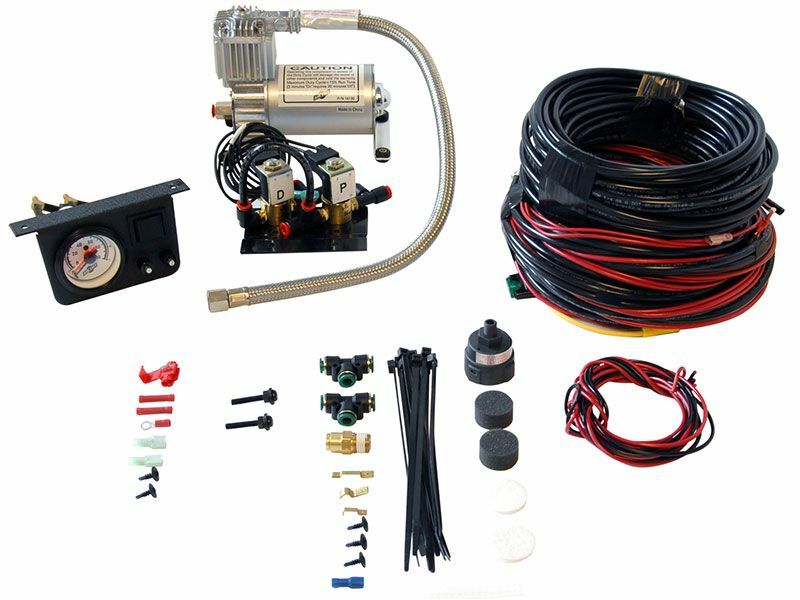 Air Lift LoadController air control systems will be free from defects in workmanship or materials for two years on the vehicle of original installation. This does not include installation or other service charges for replacement. If you have any questions on the warranty, don't hesitate to give RealTruck.com a call at 877-216-5446. Air Lift LoadController air control systems include everything needed for installation, and can be installed at home or by your trusted mechanic. Installation instructions are included with each order, and are also available on RealTruck.com. If you have any questions, don't hesitate to give us a call at 877-216-5446.